With all due respect to my friends Jon and Stephen, it seems to me that if you truly wanted to come down on the side of restoring sanity and reason, you'd side with the sane and the reasonable, and not try to pretend that the insanity is equally distributed in both parties. Keith Olbermann is right, when he says he's not the equivalent of Glenn Beck. One reports facts, the other one is very close to playing with his poop. the big mistake of modern media has been this notion of balance for balance's sake, that the left is just as violent and cruel as the right, that unions are just as powerful as corporations, that reverse racism is just as damaging as racism. There's a difference between a mad man, and a madman. The country's 24-hour politico pundit panic conflict-onator did not cause our problems, but its existence makes solving them that much harder. The press can hold its magnifying glass up to our problems and illuminate problems heretofore unseen, or it can use its magnifying glass to light ants on fire, and then perhaps host a week of shows on the sudden, unexpected dangerous-flaming-ant epidemic. If we amplify everything, we hear nothing. The message of the rally, as I heard it, was that if the media would just stop giving voice to the crazies on both sides, then maybe we could restore sanity. It was all non-partisan, and urged cooperation with the moderates on the other side, forgetting that Obama tried that, and found out there are no moderates on the other side. When Jon announced his rally, he said that the national conversation is dominated by people on the right who believe Obama's a socialist, and people on the left who believe 9/11 was an inside job. But I can't name any Democratic leaders who think 9/11 was an inside job. But Republican leaders who think Obama's a socialist? All of them! McCain, Boehner, Cantor, Palin, all of them! It's now official Republican dogma, like tax cuts pay for themselves, and gay men just haven't met the right woman. As another example of both sides using overheated rhetoric, Jon cited the right equating Obama with Hitler, and the left calling Bush a war criminal. Except thinking Obama is like Hitler is utterly unfounded, but thinking Bush is a war criminal? That's the opinion of General Anthony Taguba, who headed the Army's investigation into Abu Ghraib. You see, Republicans keep staking out a position that is further and further right, and then demand Democrats meet them in the middle, which is now not the middle anymore. That's the reason health care reform is so watered down; it's Bob Dole's old plan from 1994. We all get things wrong sometimes. I don't agree with Jon or Stephen or Bill or anyone else 100% of the time. And we shouldn't. If we did, we're nothing more than sycophants or robots, dutifully repeating what we're told. I think Jon is quite wrong with those false equivalences. Isn't the first time he's wrong, won't be the last. But is that bad enough you're going to write off all the times he perfectly NAILS it? Not for me. 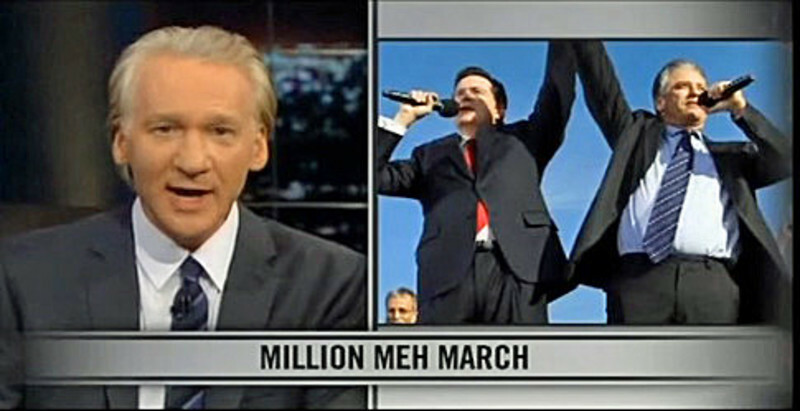 Or take Bill Maher, for example. Horribly wrong when it comes to vaccines, very misguided when it comes to distinguishing between Muslims and Muslim extremists (talk about false equivalences! ), and treats all religions the same (I'm Taoist, and it's rather offensive). But does that mean I'll do a self-boycott of his show, or despise him as a result? No, because he's right on so much of the other stuff. I will never enjoy Bill Maher as a comedian, simply because his style is anti-funny to me, and it's painful for me to watch his show. But I am going to try to less dismissive of him in the future. As Daniel Dennett says (in the upper right-hand corner): "There's nothing I like less than bad arguments for a view that I hold dear." I expect Glenn Beck and Sarah Palin to say absolutely crazy, indefensible things, but I get mad when Maher says them because -- even though, like Beck and Palin, he's just an entertainer who uses political material -- I hold him to higher standards. Why? Because when he's on-target (or close to it) he can make solid arguments, something Beck and Palin can't do and don't even try to do. When he goes moonbatty he diminishes the credibility of his better arguments.